I am not consistently witty nor well-spoken. I struggle with plucking out the best words to use to get my thoughts across in conversation and on the computer screen. Instead, I am stuck with writing things the best I can to produce an essay or a blog post that expresses my thoughts good-enough. I am not being humble, I’m just keeping it real. Don’t get me wrong, I think I’m doing just fine! I will continue to type away my hearts content for all who care to pause and read. I’m good-enough, and being good-enough will do. I just have to be good-enough to get my message out. I just have to be good-enough to hold someone’s attention momentarily until my thoughts are shared. I just have to be good-enough to resonate with one the one person God has intended me to touch. I don’t have to be great… and neither do you. Well, unless of course it is God’s will for us to be. Yes, if that is the case I am convinced He would provide us with the talent and resources for greatness… and that actually there is very little we can do on own to obtain it, besides giving a good effort and hoping it was indeed: good-enough. Sure we can obsess and work hard and sacrifice time, food, sleep, and relationships chasing greatness just to find it wasn’t in the plan… His Plan, the whole time. Greatness is truly an earthy treasure, and holds little value in God’s heart. Yes, I believe for some of us God may pave our way to greatness, if with our greatness we will touch the people God intends us to. The accomplishment of greatness is nothing more that the affirmation from the world that we are valuable. With God we don’t need the world’s affirmation! With God we just need to be where He calls us to be… where we can share His message of Love to all who cross our path! Anything more is a waste of energy. Anything less we are settling for less in life than God desires for us. The satisfaction of knowing I am playing my part in this play of life is all I need. Being good-enough is indeed good-enough for me… as being good-enough is good-enough for God. 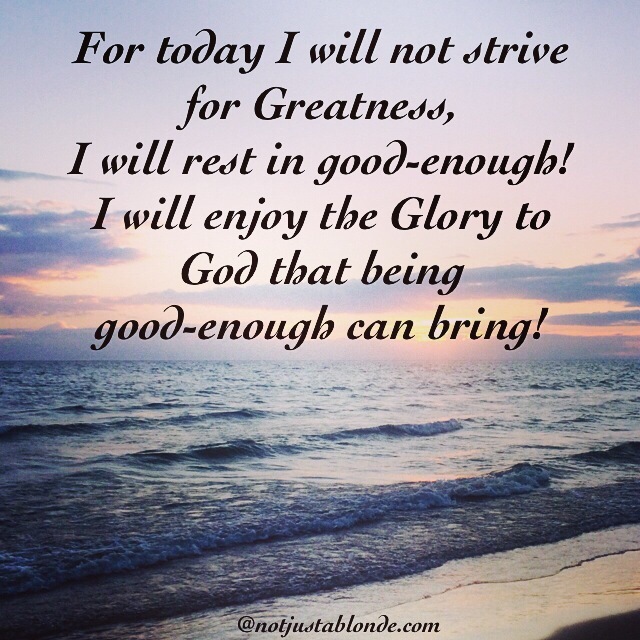 So for today I will not strive for greatness, I will rest in good-enough and enjoy the glory to God that being good-enough can bring!